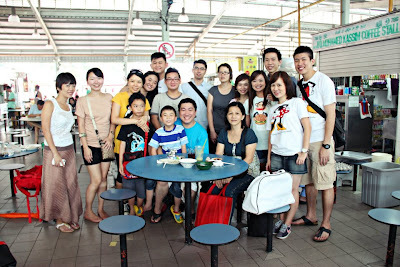 In conjuction with the opening of the rest of the MRT stations along Circle Line, the monthly makan gathering brought us to Ghim Moh Food Centre to explore the best food along the new section of the circle line. Guan Kee Fried Kway Teow is probably one of the most popular stalls at Ghim Moh Food Centre. The stall also has the title King of Fried Kway Teow from a TV show many years back. The fried kway teow was neither too dry or wet with a nice consistency that came with juicy cockles and lots of pork lard!. Teck Hin Fried Hor Fun stall sells only Hor Fun. The current stall is run by 2 middle aged men. Besides the Beef Hor Fun which we ordered, the stall also offers Seafood Hor Fun, Sliced Fish Hor Fun and etc. I like the thick gravy that is drenched over the Hor Fun and the tender beef slices. If you are a fan for Indian's food, you have to drop by Ghim Moh Food Centre and try Heaven's Indian Curry's Putu Mayam, Appom and Thosai. Putu Mayam brought back a lot of childhood memories. It was one of my favourite Sunday breakfast tearing into the vermicelli-like rice flour noodles and dipping them into the desiccated coconut and orange sugar. This is my first time having Appom and I love it! The experience was like eating both crispy and fluffy Roti Prata in one. The Appom was fluffy in the middle with crispy edges. Like Roti Prata, there are plain and egg Appoms too. Heaven Indian's Curry is probably one of the only few stalls in Singapore that makes Appom. Many people have raved about the Thosai here too. You just need to taste it yourself to understand why. It had a nice thickness giving it a crispy outer layer while the inside was moist and fluffy. It had a good balance in both taste and texture. I find that the steamed Taro Cake was a bit disappointing as I prefer those that have chunks of yam. I could not really taste the yam flavour or find the contrast in texture I was looking for. Nevertheless, Rong Yuan's Taro Cake was moist and nice. Oh! and it came with peanuts. Chwee Kueh is a common Singapore breakfast. It is basically steam rice flour topped with preserved radish (Chye Poh). Usually the preserved radish (Chye Poh) topping is sweet but Ghim Moh Chwee Kueh's version is different. This is the first time I have the salty version. According to what I googled on the web, this supposed to be the traditional receipt. Just beside the Chwee Kueh stall is this inconspicuous Fried Carrot Cake stall that uses vegetable oil. The stall sells both white and black carrot cake. We had the Black Carrot Cake. The steamed radish cake fried with black sweet sauce was soft and tasty with a generous coat of eggs. Many people have recommended this roast meat stall at Ghim Moh Food Centre. With such high popularity we definitely have to join the queue to try out their roast meat. We bought the Roast Duck, Roast Pork and Char Siew. The Char Siew was average but both the Roast Duck and Roast Pork were very good. The Hakka Yong Tau Foo has both dry and soup version. We decided to order the dry version because we felt that the picture will turn out better. The Stuffed Tau Pok (Stuffed Fried Tofu) was really crunchy and flavourful but the minced meat filling was a bit salty . My friend shared with me that people usually ordered the soup version. Maybe the soup version helps to balance the saltiness and make it a more balanced dish. The wonderful hawker food feast ended with dessert from Golden Swallow Dessert. I like the dessert here because of the fresh coconut milk. Bo Bo Cha Cha is the most appropriate dessert to highlight this. The hot Bo Bo Cha Cha was a bit too sweet but the cold one was really good. Topped with the colourful "tadpoles" like jellies, every spoonful was a sweet bursting surprise. 1) Alight at Buona Vista MRT station. Walk to bus stop along Buona Vista Road (Stop ID 11361). Take bus no. 92. Alight 1 stops later. Journey time about 3 mins. 2) Alight at Buona Vista MRT station. Cross the underpass towards Ghim Moh Estate Blk 12A. Cut across the open air carpark towards Ghim Moh Road. Cross the road and walk towards Blk 20. Journey time about 8 mins. Aiyo! I am thinking about whether a not to have supper and you post this at this hour!!!!! I want some steamed yam cake, appom or fried Kway Teow pls!!!!!! @Cuisine Paradise. LOL this hour u still want to eat supper. Order Macdonal lor. Ghim Moh Food Centre will be on my list to visit when i go back to singapore in November, I havent enjoyed eating out for a while and started sticking to home made meal to makan, well its all based on opinions really, For me for example nothing can beat homemade Chwee Kueh.